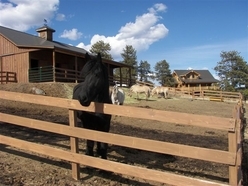 Sundance Valley where a handcrafted log cabin with 12” to 20” Swedish-cope logs and custom barn blends into its surroundings to create the ultimate Colorado escape! The home is inviting – it beckons you not only to experience but to actually live your dream. Comfortable and cozy, the home offers a main level master, an open dining, kitchen and great room area with an exhilarating 2-story view of the Pikes Peak! Find rich pecan hardwood, slate & travertine floors, rustic cherry cabinets and quality Pella windows. The warm earth tone colors used throughout the home along with the wood burning stove and radiant heat will embrace and console your spirit. The upper level has a loft area, a second bedroom & bath. There is another room for guests, office or hobbies with adjoining bath, utility room & oversized 2-car garage in the lower level. 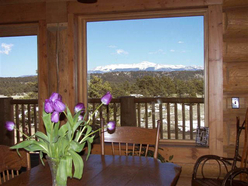 From its 3-sided wraparound and covered deck, be welcomed by the silhouetting effect of the sunrise behind snow-capped Pikes Peak and watch the light dance across endless Colorado blue skies and serene vistas. Enjoy the day at home with family and friends or head out for day – you’re located within easy driving distance to fishing and boating at Elevenmile State Park & Reservoir, snow skiing at Breckenridge, as well as hiking, riding, hunting activities on the nearby or adjacent public lands. When you return to your mountain home with its lights aglow you will feel the pull at your heartstrings, experience a sense of wonder and be captivated by all its incalculable qualities. As night falls, expect brilliant sunsets beyond the timbered edges of the property and quiet starlit evenings (enjoyed from the Jacuzzi). The spacious 36’ X 60’ board and batt barn with old style copula, abundant gently rolling meadows, spring-fed pond & adjoining Pike National Forest complete the picture of an ideal Colorado property. Sundance Valley is the natural expression of high mountain splendor!